Memorial Manor was built adjacent to Memorial Hospital in 1972, when Fidelis Nursing Home closed. The Fidelis Nursing Home Board of Directors, including Mrs. H. H. “Liz” Felty, Mrs, J. M. “Mary Bruce” Woodbury, and Mrs J. S. “Audrey” Cliett, were instrumental in the construction of the new nursing home when they transferred the Fidelis assets to the Hospital Authority. Memorial Manor opened under the leadership of Herbert Nussbaum, Chairman of the Hospital Authority, Houston Wisener, Administrator, Loreta Coggins Brown, Supervising Nurse for the Memorial Manor, and Mrs. Irene Toole, Director of Nurses for both the Hospital and Memorial Manor. An addition to Memorial Manor was constructed in 1979, adding 40 beds to the existing Manor’s 67 bed capacity for a total of 107 beds. Memorial Manor is licensed by the State of Georgia. Over 75 employees are currently on staff to assist Memorial Manor’s residents. The Excellence in Action Awards recognize skilled nursing homes, assisted living, and independent living communities that achieve outstanding resident and/or employee satisfaction. This award is especially significant because the My InnerView database is the largest warehouse of long-term and senior living satisfaction metrics in the U.S.
Memorial Manor is surveyed annually by CMS, and they must follow certain guidelines and policies to be eligible to continue to provide care as a Long Term Care facility. The annual survey was completed September 14-17, 2015, and we are very pleased to report that we received a deficiency free survey. This means that the CMS surveyors did not find any major issues or concerns during the survey period. The Manor hosted their annual Open House on December 4, 2014 at 6pm. Residents, family, and staff were present and enjoyed food, fellowship, and entertainment. Evening: The evening started off with an introduction and welcome by Billy Walker, a devotional prayer by Reverend Gaines, and then singing by the Light House Children’s Choir. Billy Walker and Karell Bush joined the Light House Children’s Choir at the end for a rendition of the 12 days of Christmas. Fun and joy was had by all, and it was a splendid event. The residents enjoyed it very much, and had nothing but smiles!!! Thanks to everyone that made this event successful! My InnerView, a third-party applied research company providing leaders in skilled nursing with tools to measure, benchmark, and improve performance, conducted the confidential survey on behalf of Memorial Manor. The surveys were mailed to the residents or their family members, assessing the perceptions of more than 75 people. Surveys were returned directly to My InnerView for data processing. The survey is conducted annually in September. “We are committed to providing quality care to our residents. This feedback allows us to identify our strengths and opportunities so that we can provide a safe, positive, and caring environment for our residents. Our participation in this survey is in direct correlation to the national effort to improve quality of care and operations within long-term care organizations. Our goal is to obtain as much information as possible in regards to improving the quality of care, quality of service, and quality of life for the residents that we serve,” said Cynthia Vickers, RN, Nursing Home Administrator. 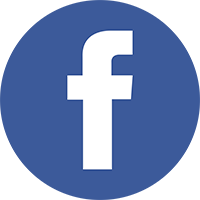 “I would like to thank everyone that participated in the survey process for Memorial Manor. We appreciate you taking the time to share your thoughts and feelings so that we can learn how we can provide better service to you and your family. We were very pleased with our survey results, and will continue to work on areas that need focus. It is always our goal to exceed your expectations, and continue to look for ways that we can improve,” stated Billy Walker, CEO of Memorial Hospital and Manor. “By listening to the voice of the customer, Memorial Manor has invaluable data to help them improve and deliver a higher quality of care to their residents. Memorial Manor’s survey results are a strong testimony of the good work that they are doing. Certainly, there is always room for improvement, but satisfaction is high and at the end of the day, the quality of care that a resident receives is what truly matters,” said Neil Gulsvig, CEO of My Innerview. 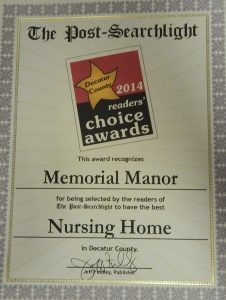 Congratulations, Memorial Manor, on winning the Post-Searchlight’s Readers Choice Award for Nursing Homes for 2013. 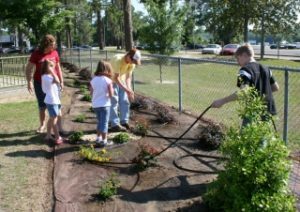 Memorial Manor appreciates the donation of landscape materials, plants and labor from the students of Grace School. The beautification of the Manor courtyard is appreciated by our residents and staff.